RAMS Lab Director Jaydev Desai with a prototype of the MINIR robot. Researchers in the Robotics, Automation, and Medical Systems (RAMS) Laboratory are working toward the development of a meso-scale robot that will help neurosurgeons overcome limitations in current intracranial procedures involving brain tumors. The Minimal Invasive Neurosurgical Intracranial Robot (MINIR) will assist in the removal of brain tumors while functioning in an intraoperative MRI environment. According to Dr. Marc Simard in the Department of Neurosurgery at the University of Maryland School of Medicine, MINIR will revolutionize the process of tumor removal by overcoming the challenge of creating a “very small machine [that can] work in delicate spaces.” Current procedures require surgeons to create a corridor equal in size to the tumor they are attempting to remove, since they must work within their line of sight. As a result, they must cut through live tissue to access tumors that lie below the surface of the skull. MINIR will be MRI compatible, allowing human operators real-time access to three-dimensional images during the procedure. Mingyen Ho, a Ph.D. student working in the RAMS Laboratory under the supervision of RAMS Lab director and Associate Professor Jaydev Desai (ME/ISR), explained that MINIR will liquefy the tumor and wash the debris from the intracranial cavity. With MINIR, surgeons will be able to work within a smaller corridor and remove the tumor without potentially injuring the healthy brain tissue that surrounds it. The project, led by Desai, has the potential to have a significant healthcare impact in the area of brain tumor removal. 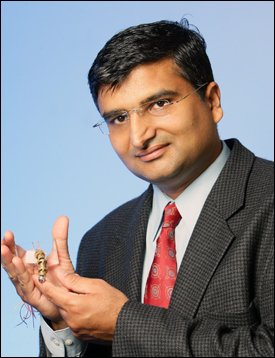 As a result of this innovative project, Desai has been selected by the National Academy of Sciences (NAS) to present a seminar at the Beckman Center in Irvine, California in June of 2011. His talk will be part of the “Distinctive Voices” seminar series of NAS.